Sometimes the crowd sourcing deals lure me into places that I have no business even entering. A $5 for $10 worth of food at Ted’s Fish Fry was tantalizing enough to get me to try out the new Wolf road location of the beloved area hot spot. I have actually been meaning to check this place out, mainly because I wanted to see how they changed the restaurant ever since it was Buffalo Wings and Rings, a spot I used to frequent for buffalo chicken while Scubbers was not in business. As far as I can tell, they didn’t do much to the front of the restaurant, and opened the back up so you can now view the kitchen. I mentioned I have no business walking into a Ted’s Fish Fry. I don’t like eating cooked fish. Sushi, I generally have no problems with, but once you cook the fish, it takes on a texture that I just can’t do. In the past, I’ve gotten by at Ted’s by ordering the chicken fingers. 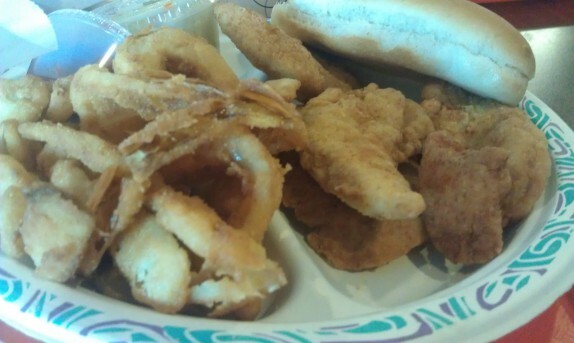 This time, I decided to go with the chicken finger dinner (with onion rings instead of fries), and to add an order of fried clam strips, which I thought would be a reasonable thing to try at a seafood place. The chicken fingers and onion rings were fairly standard. It’s clear they are breading their own stuff, and the breading is appropriately seasoned. They give you a hot dog bun with it, which is kind of weird, but whatever! The clam strips tasted ok. There was an aftertaste, and I couldn’t figure out if that was from a seasoning, inferior clams, or overused oil. It’s really hard to say. The breading on these was a cornmeal base. They were super crunchy. They gave me a hot dog bun with this too, which was also really weird. I was a little surprised that such a meal was as expensive as it was $19 including a medium soda. Of course, it was an additional $9 after using the $10 crowd sourcing deal that cost me $5. $14 is the absolute maximum I’d expect to need to spend on such quality fried foods. 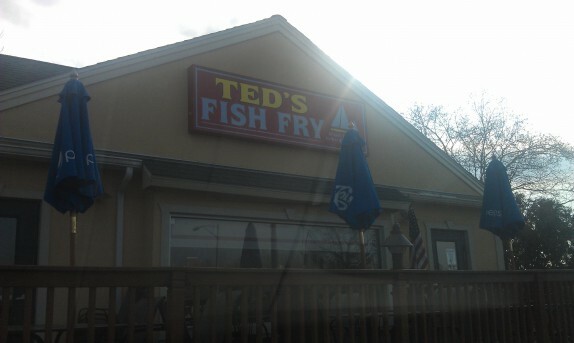 Needless to say, I can say I went to Ted’s, I didn’t try fish fry, which I wouldn’t anyway, and I wasn’t wowed. I like a good fish fry (I’m from the Midwest where frying is the only way we ate fish), but those prices are outrageous. Long John Silvers is expensive too. I can’t figure it out, it’s not like you’re getting Ahi Tuna, you’re usually getting some sort of cheap whitefish. You mention you don’t like cooked fish – but do you like a rare seared tuna? What about eel on a sushi platter? I ask about eel because it is one of my favorite pieces of sushi even though I usually consider myself a sashimi girl. The fried clams and dipping sauce at New World Bistro are the BEST I’ve ever had (and probably cost the same – ha!). I love seared tuna. The more and more cooked it gets, the less I like it. I will have to try them at NWBB. They give you a hot dog roll w/the clams in case you want to make a clam roll. The chicken fingers… well, I’ve been eating Ted’s since I was 5 or so and I never quite understood that one. But, it’s really too bad that you don’t eat cooked fish, because you’re missing out on the best thing about Ted’s. 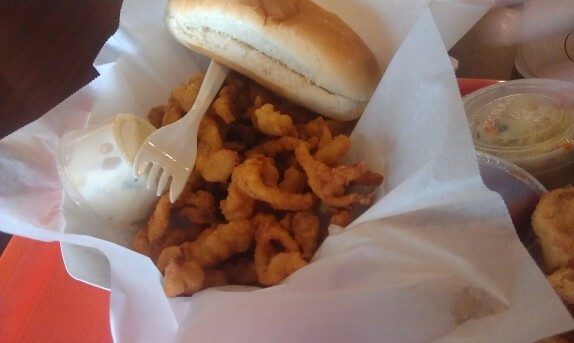 It’s really funny, a friend ordered a clam roll and paid just about as much as I did for the platter and got a significant amount less clams. Next time I go, I might break down and try the fish fry. I live in Maine now and, even though I’m looking out onto the ocean every day, you wouldn’t believe what we pay for clams up here compared to back home. Granted, we’re a bit more touristy and the clams are more likely to be full bellied, but still–$10 for a dinner is just silly for strips. If you don’t try the thing they specialize in … *shrugs* It’s like saying “oh, I hate Red Lobster, ’cause their steaks aren’t very good,” y’know? They were fairly good on the Tour de Fish Fry — not the very best, but certainly the place I’d stop if I had a craving for fish fry and was near one (which since they have a Wolf Road location is quite possible). You raise a good point that hasn’t come up in a while because I haven’t had a bad experience in a while (not to even claim this was a bad experience). I am a firm believer that a good restaurant should stand behind its menu offerings. You shouldn’t to go into a place that specializes in seafood and be afraid to order seafood (i.e. clam strips). I do understand, fish fry is what they claim is their thing, but the remainder of the menu should stand on its own. This isn’t to say that just because a Chinese restaurant offers a BLT it should be safe, of course there are boundaries and limitations. But I believe there is a real effort going on in the kitchen, and even the items I ordered, clam strips, onion rings, and chicken tenders had a personality of their own, and were clearly hand battered and fresh. There’s a good possibility the batch of clams I had was subpar (or the oil was overused). Like I noted, it was alright. The price for what it is to me sets it as some place I don’t really need to visit often.